Historical, highly collectable art gallery quality M1911 Wall Charts printed in Royal Blue & Tan ordnance colors on heavy 80# poster stock. Embossed leather grain plastic laminate finish. Early U.S. ordnance "engraved plate" style Wall Chart illustrations from the companion book- The U.S. M1911/M1911A1 Pistols (Volume 2 in the Kuhnhausen .45 Auto series) Click here to see a larger view. 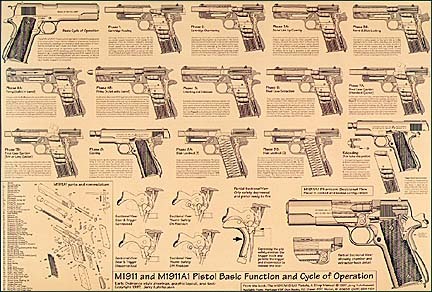 This incredibly detailed, gallery quality M1911/M1911A1 Pistol Cycle of Operation Chart shows the M1911 operating cycle and basic function in sequential stages. 25 Drawings in all. 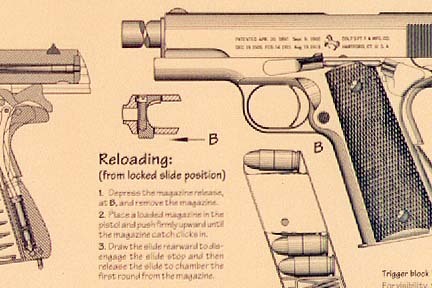 "When it comes to explaining in historical ordnance language how an M1911 works, Heritage-VSP Publications chart clearly illustrates each phase of operation and shows the action of each involved part. The chart also details the M1911's disconnector and thumb and grip safeties in separate closeups... Also included is an exploded parts diagram, which includes the Series 80 firing pin safety subassembly. This chart, which comes in two different sizes, should answer virtually any question about the M1911 cycle of operation." 25"x17" Den & Gun Room Size - $24.95 U.S.
2 wallcharts ship for the price of one. 39"x25" Shop & Training Size - $29.95 U.S. Charts can't be folded & boxed with books and are shipped separately in rigid, 3 ply mailing tubes with protective end caps. See order form for wall chart shipping offers.